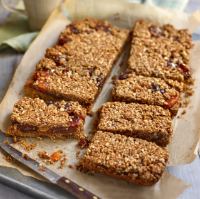 Made with oats and spelt our, these are a low-gluten option and ideal for lunchboxes. 2. Meanwhile, put the filling ingredients in a small, heavy-based saucepan. Set over a medium heat and simmer for about 15-20 minutes, until the fruits are soft and the juices are nearly absorbed. Take off the heat and set aside. 3. For the crumble, put all the ingredients, except the salt, in the food processor. Blitz briefly or pulse to a crumble mixture; don’t overmix or you will end up with a ball of dough. 4. Spread the cooked fruit mixture evenly over the baked base, then top with the crumble. Sprinkle with the flaky salt and bake for 20-25 minutes, until golden. While it’s still warm, firmly press the crumble all over with a spatula. Leave to cool completely in the tin before cutting into bars. The bars can be stored in an airtight container for up to 2 weeks.